It must be confusing for wild animals when humans constantly grow so much tasty food, only to try and keep it all to themselves. I see it in my own garden when the various fruits become ripe. All the birds I’ve fed through the winter are suddenly competition for my harvest in summer and fall. I’m not fussed about sharing the cherries, plums, red currants, apples and grapes with the birds. There’s usually more than enough for all of us. But in Australia and elsewhere, vineyards can lose up to 80% of their valuable crop to starlings, rosellas, cockatoos, and thrushes every year. Until now, common solutions to keeping birds away from the grapes included expensive netting to block the birds from getting at the goods (but which can also make spraying difficult), noisy gas cannons to shock them into flight (but which also sometimes cause fires), and reflective tape, hawk-shaped balloons and recordings of predator calls to frighten them. But birds can get into and tangled in the netting, and as for noise and shiny or floating objects, as soon as the birds realize they won’t get hurt, they just ignore both. I’m reminded of a hike I took in Sheffield, England a few years ago, when I saw another bird control solution in the crop fields: Individual crows, dead and hung upside down at regular intervals from wooden posts as literal scarecrows. I don’t know how effective it was on other birds, but the sight definitely kept me out of those tilled properties. Maybe with something almost as ominous in mind, researchers at Charles Sturt University in Australia undertook a study at six vineyards in Victoria to see whether aggressive birds could be used to frighten grape-thieving birds from the vineyards. In this case, the idea was to build observation perches for predatory birds like falcons, who would hunt vineyard thieves, and serve as a warning against hungry flocks. For whatever reason, the falcons were not seduced by the five-meter high invitations to rest. But another kind of bird was: The mythical magpie. To be precise, the Australian magpie. I should note here that these magpies are not corvids, unlike Eurasian magpies, which are. There’s a great article here for a breakdown on the difference, and why Australian magpies are called magpies. Be that as it may, over centuries and continents, magpies have been the subject of legends, both good and bad. They’re thieves and harbingers of death; they’re a sign of bad luck if seen alone, but of good luck if seen in groups; in many Asian countries the bird is associated with happiness, while in Native American lore, it’s a symbol of friendship and fearlessness. For better and for worse, humans have a long-standing relationship with these birds. It was magpies, rather than falcons, that took an unexpected liking to the high perches in the Australian study, probably because (as the researchers state) the perches provided excellent observation points for the lizards that magpies hunt. I also read of the winery in South Australia that enthusiastically welcomes the territoriality of magpies in keeping other birds at bay. Their voracity for insects means that they pick out pests from the trunks of the vines, each vineyard row monitored by its own magpie. Some of our favorite science stories are born as the results of research that sets out to find one solution and then finds another. Researchers who had been looking to attract falcons to vineyards found that vineyards with magpie perches had a noticeable reduction in crop loss to smaller birds. In the study area, this was a reduction from 9% of the crop in vineyards areas lacking magpie perches to only 4% in the areas under the shadow of the tall wooden constructions. Magpies might not be direct predators of smaller adult birds, but they do eat eggs and chicks of other birds, so that might be one factor as well as their simple threatening presence on the perches. Researchers speculate that the falcons might prefer more natural looking branches to the straight perches, so a further study will test those. Meanwhile, I am wondering what kind of impact these large birds might have overall on populations of smaller birds, insects and lizards in vineyard regions. Do the smaller birds move elsewhere? Do lizards keep down insect populations that might flourish in their absence if the magpies leave? Viewing vineyards as agro-ecosystems rather than mechanistic crop factories changes the equations in the most interesting ways, this time offering a further strand in our long history with magpies. 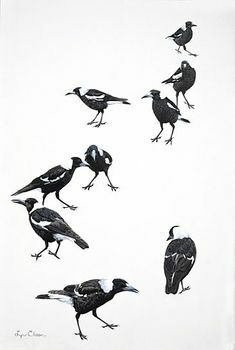 There are almost as many terms for a flock of magpies as there are myths about this clever, communicative bird, and doubtless many more eco-interactions than names. Something to ponder over my next glass of Australian wine. *A murder, a charm and a gulp are just a few of the collective nouns we use for magpies. Murder is also the collective noun for crows, corvids like the Eurasian magpie.